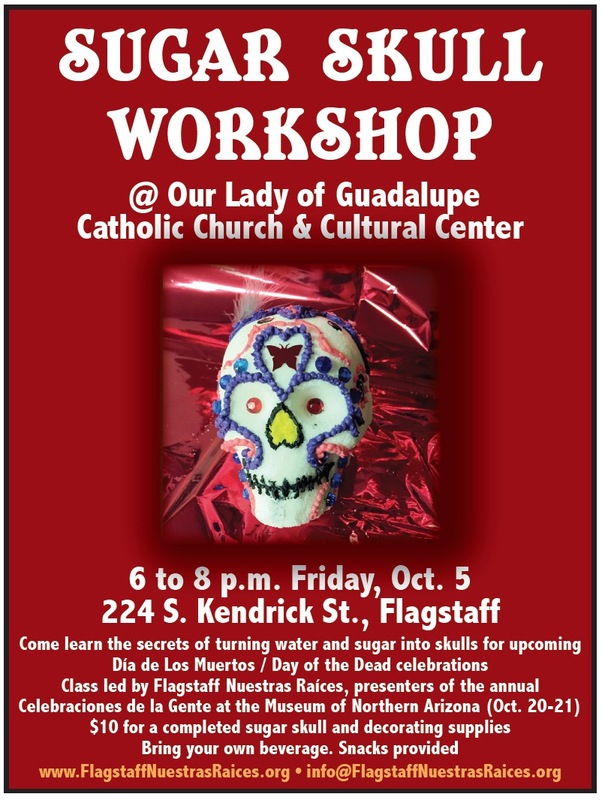 FLAGSTAFF — Flagstaff Nuestras Raíces will present its annual Sugar Skull-making workshop from 6 to 8 p.m. Friday, Oct. 5 at the Our Lady of Guadalupe Catholic Church Cultural Arts Center “The Basement,” 224 S. Kendrick St., Flagstaff. Come learn the secrets of turning water and sugar into skulls for upcoming Día de Los Muertos / Day of the Dead celebrations. Class led by Flagstaff Nuestras Raíces, presenters of the annual Celebraciones de la Gente at the Museum of Northern Arizona (Oct. 19-21). $10 for a completed sugar skull and decorating supplies. Bring your own beverage. Snacks provided. Visit www.FlagstaffNuestrasRaices.org or send an email to president@FlagstaffNuestrasRaices.org or info@FlagstaffNuestrasRaices.org for more information.